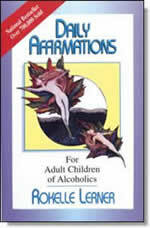 As adult children of alcoholics, we can continue to remain in the past and believe the negatives that we were taught; or we can change our beliefs with affirmative thoughts that can set us free into better and more expansive experiences. What we choose to believe will ultimately rule our world. Affirmations are a way to wake us up--to make us fully conscious and aware of the daily choices we make. And, as we learn to direct our thoughts, our feelings and behavior will naturally follow.